Prepare a 10-inch non-stick skillet with cooking spray and place over a cold burner. Whisk together the eggs and water; pour the egg mixture into the cold skillet. Cover and turn the burner on for medium-low heat. Cook until steam begins to vent from the skillet. Remove the lid. Sprinkle the crumbled bacon, Cheddar cheese, salt, and red pepper over the eggs. Spread the onions over the eggs. 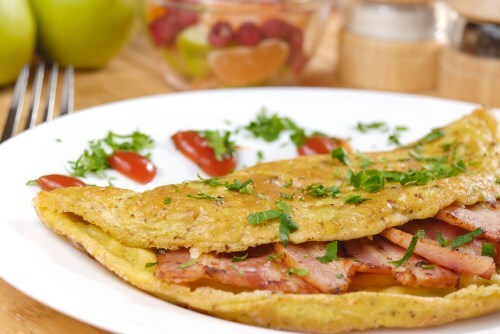 Gently swirl the skillet in a circular motion to release the omelet and slide it onto a plate. Fold the omelet in half. Allow the cheese to melt, about 2 minutes.